QuickStix LVT, pre-applied adhesive for LVT flooring, was designed to expedite the LVT installation process, as well as extend its effectiveness to projects where adhesives prove challenging. Upon receipt of QuickStix-backed LVT, the tile is immediately ready to be installed and sticks and sets upon installation. The high performance of QuickStix is due to its moisture resistance properties. Even with extreme subfloor moisture—up to 99 percent RH and 18 lb MVER—QuickStix not only sticks: it can stand up to walking and heavy rolling loads, instantaneously. The product’s water-based adhesive technology does away with the need for adhesive pails, trowels, and long hours of labor. Simply, peel, position and roll. QuickStix contains no VOCs. 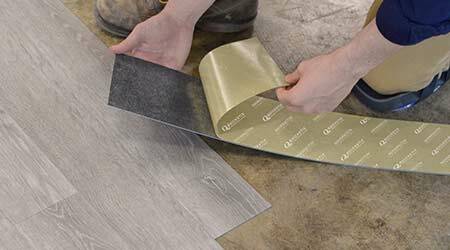 Further improving IAQ is Mannington’s patented Quantum Guard HP, the industry’s highest-performing wearlayer—an aluminum oxide topcoat cured by an ultraviolet process for durability, easy cleanability, and slip-retardance. A 10-year warranty covers both the product and the adhesive.